A hot cup of coffee in the morning can elevate your mood almost instantly. Not having the coffee can make regular coffee drinkers groggy. Moreover, everyone has their own preferences when it comes to coffee, and only you can brew your coffee exactly how you like it. Having a coffee maker at home can give you that freshly brewed, life-saving cup of coffee to accompany you on Monday mornings and during all-nighters before an exam. Reviewed below are single coffee cup servers that you may be interested in buying. Keurig is the leading beverage brewing system, and its coffee makers are often considered the best. This model by Keurig is especially popular with customers and is backed up by several positive reviews. Like with most other single serve coffee makers, you load a K-cup pod, choose your settings and give the coffee maker approximately a minute to brew your coffee. This model has LED-lights on its buttons which guide you through the whole brewing process. The first step is turning on the coffee maker and waiting for it to heat up, load your K-cup pod and pull the handle down, it then asks you to choose one of the three serving sizes (small cup, small mug, and large mug). After selecting a cup size, your coffee will start brewing. This product has mixed reviews when it comes to durability but is overall rated as a durable product. This model by Keurig comes with additional features in comparison to the model reviewed above. In this model, the water reservoir is larger (80 oz instead of 48 oz) allowing you to brew 10 coffee cups before having to refill. It also comes with additional K-cup brew sizes (4, 6, 8, 10, 12 oz). The two distinctive features of this product are the strength control, which can make any K-cup stronger in flavor with five temperature settings to let you enjoy your coffee at the desired temperature and the hot water on demand feature. This model is an upgraded version of the one reviewed above and is more appropriate for use by several people. This Mr.Coffee coffee maker is powered by Keurig technology, which means the mechanism by which it brews your coffee using K-cups is the same. This model sure is more traditional in appearance compared to the advanced Keurig product but is a reliable and durable product. This model does not have any special features likes multiple K-cup sizes or temperature settings. It does not have a water reservoir, so a fresh cup of water needs to be added each time. But if you do not necessarily need these features and would like to save quite a few bucks while having the same level of durability, this product is for you. 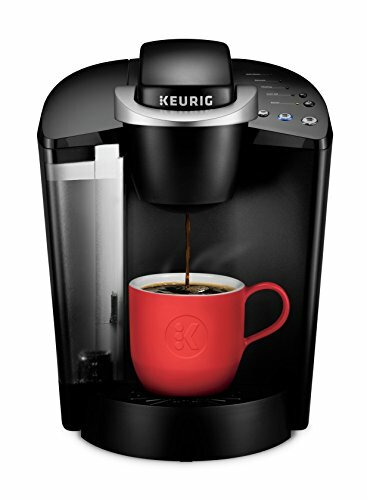 However, this model does allow you to use both K-cup pods and brew your own mix in its reusable cup. This Black & Decker professional coffee maker is ideal for people who want a cup of coffee on the go. The travel mug with this coffee maker is excellent for use for a single person in the habit of grabbing a cup of coffee and heading out of the house. The downside to this coffee maker is that it is not compatible K-cup pods. However, if you’re a fan of plain coffee, this model is perfect because you can easily add your own coffee (making it easier to clean) or use a soft pod. The best feature of this coffee brewer is that it is compatible with K-cups pods, soft pods, tea pods, loose tea, and ground coffee, with different drawers for each. This means that it’s great for a household where everyone enjoys their tea or coffee differently. It does not have all the advanced features that Keurig models do but does brew 4-14 ounce servings, it also has an option to extract more flavor to make your coffee stronger. Most customer reviews comparing this model to Keurig products say that this model is more durable and works more efficiently. The first step in choosing a coffee maker is deciding whether a single-serve coffee maker or a pot coffee maker would be more appropriate for you. If you live in a household where everywhere has the same type of coffee at the same time, then a pot coffee maker would be more appropriate since the coffee will not go to waste. However, if you live alone or the people in your home like their coffee differently, or have it at different times, a single-serve coffee maker would be a more appropriate option. Moreover, single-serve coffee makers come with more features and allow you to have different flavors of coffee. 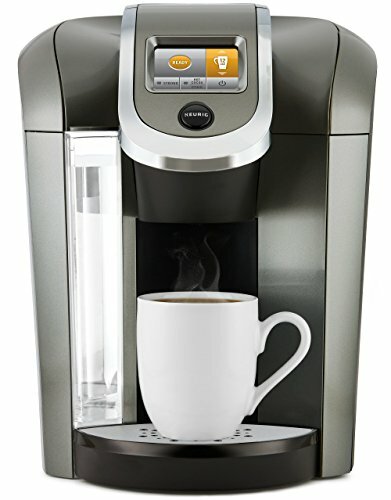 If you are a fan of K-cup pods and their flavors then choosing a Keurig coffee maker would be the best choice. However, some people, especially those who are frequent coffee drinkers, find K-cup pods expensive. In that case, choose a model which allows you to use your own ground coffee or a soft pod. Keurig models are usually more expensive than other companies so this will save you money. Of course, there are also models that allow you to use both K-cup pods and ground coffee. For single person use, you can choose a coffee maker that doesn’t have many advanced features, a simple coffee maker with a travel mug might be the best option for you. However, if the coffee maker is to be used by several people, for example at the workplace, then choose a very durable model with a water reservoir and multiple settings. There are several options when it comes to choosing a coffee maker. Single-serve coffee makers save coffee from being wasted, let you enjoy a variety of coffee flavours and come with many features such as strength control, coffee control, water reservoirs, etc. Since there is so much to choose from, you are highly likely to find a model that is perfect for you. At the end of the day, investing in a coffee maker is money-saving in the long run since its much cheaper than buying coffee on a daily basis. Whether your day doesn’t start without coffee or you enjoy an occasional nice cup of coffee, buying a coffee maker is never a bad idea.